Nowadays, 48 h are available in clinical kidney transplantation, for matching and transportation of kidneys. Preservation, by either cold storage or hypothermic perfusion, permits these 48 h, sometimes with damage to kidney function, which is usually reversible within a few days. There are some reports in literature (1, 2) where preservation times over 48 h, and up to 90 h are mentioned. Nevertheless, transplant surgeons prefer to transplant a kidney within 48 h, and more time is seldom needed. 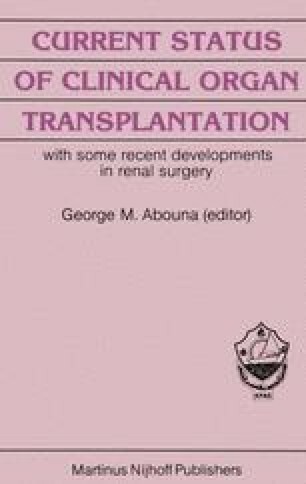 Only when extended preservation times up to one week (intermediate term) are realized, will new immunological techniques intended to improve the results of clinical kidney transplantation and world-wide sharing of kidneys, necessary to reduce wastage of kidneys, become reality. Therefore research in the field of kidney preservation continues in several laboratories over the world.